One question people often ask me, how I manage my life and divide the time between family, work, and the blog. Even, I was asked whether I give enough time to the family or how I manage to blog when my work indeed is a demanding one. I don’t answer whenever I felt a little bit of criticism over there but I answer when I feel this can help somebody who is like me; who wants to balance everything in her life (or his for that matter) without compromising a single bit of life. Till now I am a fulltime professional and it is probably the flexible nature of my daughter that helped me to work with the peace of mind. Coming to the family, I probably have the best people as part of my family who supports me, helps me and are proud of my decisions. Last but not the least, my blog, which started as a recipe blog but now is a mixed bag comprising of whatever I eat, review, and even I write about the travel diaries. Coming to the heart of my blog, recipes, I only write about the food that I cook for us, for the family. It is basically the home cooked food, which I click and write afterward. I always prefer fuss-free cooking without involving criticality and that is natural given I have limited time to manage everything at my place. This probably the reason, I have a knack towards the readily available pastes, purees, lemon concentrate etc considering those are as good as the freshly extracted or brewed. I try several brands, I store those, especially to create something whenever I am out of time or I have to cook for suddenly welcomed guests! Recently “Dabur Hommade” has surprised me with a big fat box full of goodies, and when I am writing “big fat”, believe me, it was big. 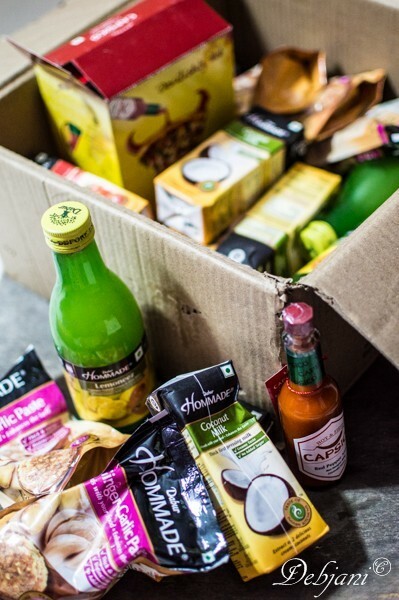 They had sent me 4 packs each of Dabur Hommade Ginger-Garlic Paste, Dabur Hommade Tamarind Paste, Dabur Hommade Tomato Puree, Dabur Hommade Coconut Milk, Dabur Hommade Lemoneez, and Dabur Hommade Capsico! I have used these products several times before except Capsico and in fact, Lemoneez is a savior to me whenever I don’t have lemon in stock but crave for Lemon tea or Nimbu-pani and same applies to the Ginger-garlic paste. Capsico is the only thing I have not tried before, however, now that I have four cute bottles of the same I am utilizing that with our portion of noodles and with so many dishes. Dabur is one brand which is a family favorite since long! My dad even asked; “had they sent you chyawanprash with the paste and purees! !” (Well, I and dad love to have roti with Dabur chyawanprash! 😛 ). Dabur is one company that is synonymous with many products at our home that probably because of the “Science-based Ayurveda” motto they believe. 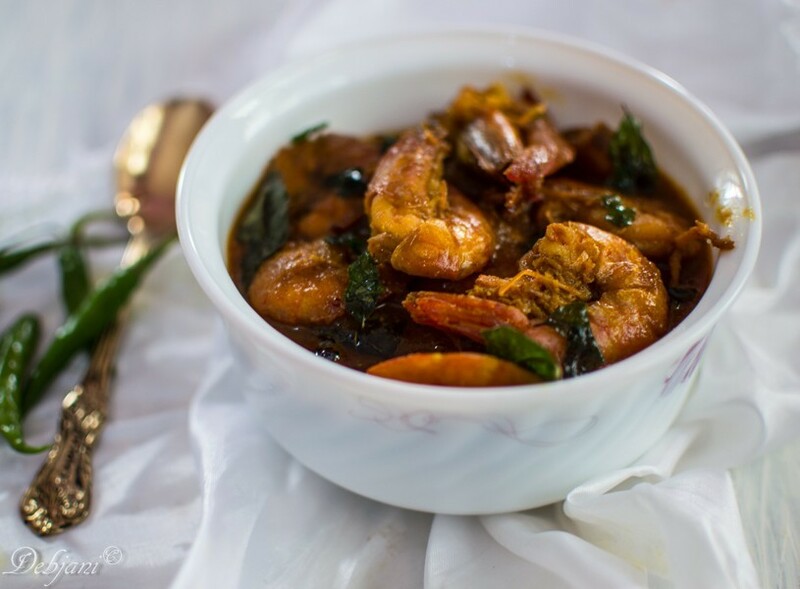 Now that, I have a good lot of Dabur Hommade products to utilize at my kitchen, I ended on making South Indian Prawn Curry with Coconut Milk, Tamarind Paste, and Lemoneez while making the South Indian Prawn Curry. In fact, I escaped the Capsico intentionally as Pasta had the Prawn Curry and she is not fond of hot curry which is quite normal in her age. 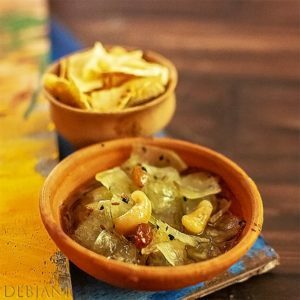 If you are going to try the recipe, you can add Capsico as well. Garam Masala Powder: ⅔ Tsp. Wash Prawns thoroughly and de-vein and de-shell those. 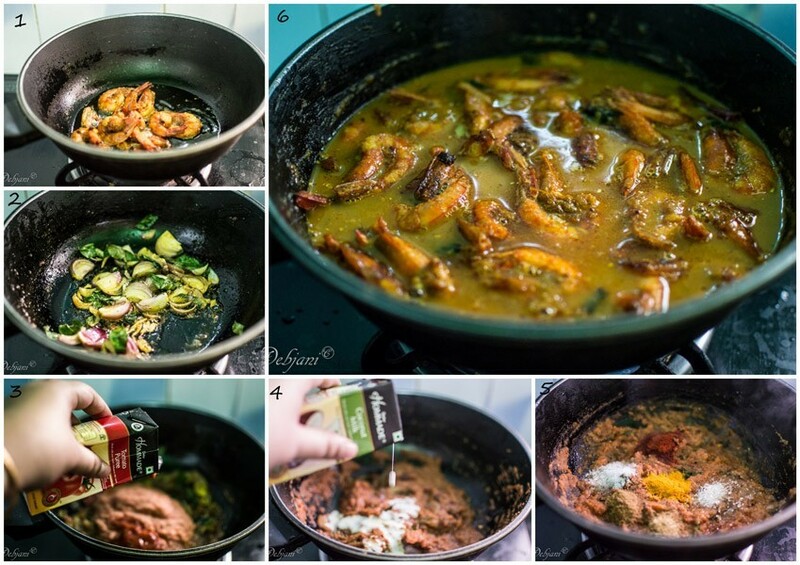 Leave the prawns for 15 minutes after rubbing half of the salt and turmeric Powder. Heat Oil in a wok and fry marinated prawns until those turn reddish in color. Strain from oil and keep aside. Temper the remaining oil with Asafoetida, Curry leaves and dried red chili. Add chopped onion and fry till the onion turn golden in color. Now add Onion paste and Tamarind paste and cook for 2-3 minutes. Now add ginger-garlic paste and tomato puree. After thorough mixing cook for two minutes until the raw aroma of tomato gone completely. Add Cumin Powder, Coriander Powder, Turmeric Powder, Red Chili Powder, Sugar and Salt and cook till the mixture leaves the edges of the pan. Add Coconut Milk and bring the mixture to boil. Now add 2 cups of water and fried Prawns as well and cook by covering the pan till the desired consistency reached. Add Garam Masala Powder and little Lemon Juice (I have used Lemoneez) and finish the curry. 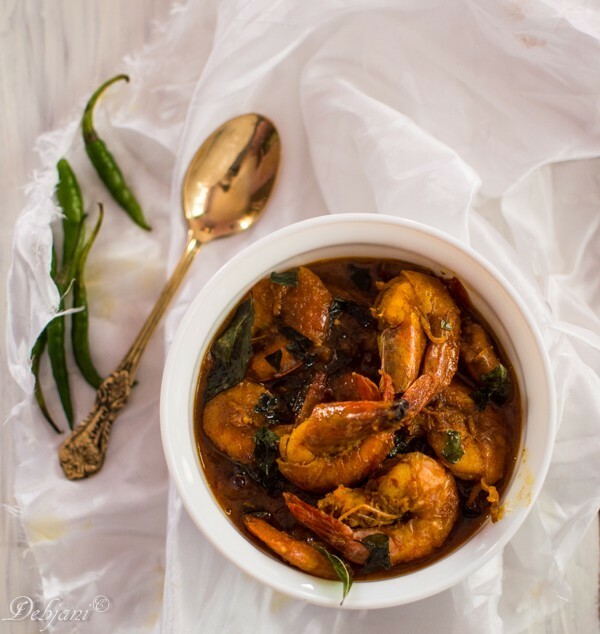 Serve South Indian Prawn Curry with hot steamed rice. Disclaimer: PR samples received from Dabur Hommade.